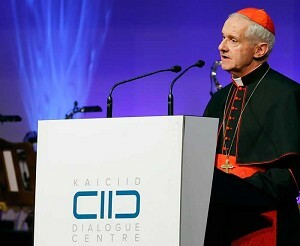 Cardinal Jean-Louis Tauran, president of the Pontifical Council for Interreligious Dialogue, delivers his speech during the opening ceremony of the King Abdullah Bin Abdulaziz International Center in Vienna Nov. 26. The new Saudi-backed interfaith center will provide an opportunity for the church to promote religious freedom for Christians and others around the world, said Cardinal Tauran. VATICAN CITY — The Vatican addressed concerns about its participation in a new Saudi-backed interfaith center, insisting that it would use the forum to press for the religious liberty of Christians in Muslim lands. A Vatican delegation was scheduled to join U.N. Secretary-General Ban Ki-moon and other dignitaries in Vienna Nov. 26 for the inauguration of the King Abdullah Bin Abdulaziz International Center, which is named for and financed by the king of Saudi Arabia. "Some questions have been raised regarding the motives and the meaning of the Holy See's adherence to this initiative," said Jesuit Father Federico Lombardi, the Vatican spokesman, in a statement Nov. 23. He noted that the Vatican is officially a "founding observer" of the center. Father Lombardi said the center's purpose is "to foster dialogue among religions and cultures," which he called a "basic and an urgent need for the humanity of today and tomorrow." He noted that Austria and Spain, "which have centuries-old Christian traditions," are co-founder states of the center along with Saudi Arabia. The Vatican will use its role in the center to call for the "effective respect of the fundamental rights of Christians who live in countries with a Muslim majority, in order to promote authentic and integral religious liberty," the spokesman said. He said the Vatican was participating in the center "in order better to put to use her experience and trusted expertise in the field of interreligious dialogue."